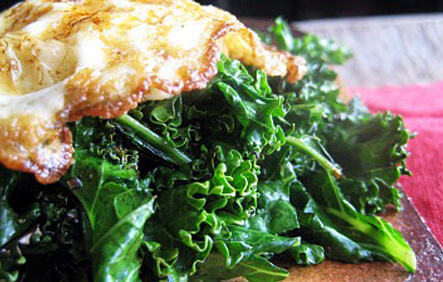 This breakfast kale recipe is simple, but addictive like potato chips. It’s best served under a dippy fried egg. There are four oil options below. The flavor of the oil definitely changes the flavor of the dish so you might like to rotate through them till you find your favorite. In a large saute pan over medium heat, warm oil and red pepper flakes until oil is glistening. Add kale, sea salt and pepper. You may want to start with 1/16 tsp sea salt and work up to 1/8 tsp, if you feel you need more salt. Turn with tongs until all of the kale turns bright green and shiny. If any dull pieces remain, keep turning. It will take approximately 3 minutes. Serve under a dippy egg and enjoy! There is a big stalk running down the middle of kale that isn’t very tasty. It’s edible, but it’s too tough to enjoy. Just strip the kale from the stalk! Molly is a health supportive Private Chef & Chef Instructor in Los Angeles, CA. She also stars in the culinary series Farm to Table and authors Organic Spark, a healthy food blog.